Fifteen years ago, the Quintana Roo area (what is known as the Mexican Caribbean) was a land full of opportunites for those who where visionaries and invested in beachfront. Today they are very glad they did as the prices for beachfront in that area went off the roof. Nowadays, Sabancuy receives exceptional investing from mexico and abroad for tourist and residential developments. the added value in the next three years is commonly ranked the 5th highest in the world by the leading US analyst. for example, Campeche Playa (AAK-BAL) the biggest tourist development in Latin America is located on the same coastline between Champoton and Ciudad del Carmen, only 25 minutes from the property. The development consists of a marina, Jack Nicklaus golf course, five star hotel and 3500 units with mixed use (condos, villas, commercial). Three hours from Merida, two international airports in less than an hour distance. These beachfront lots are located lees than an hour south of the beautiful colonial city of Campeche (also the state’s name- Campeche). If you were driving north from Ciudad del Carmen, it would be about a 30 minute drive. The city of Campeche, the capital of the state of Campeche, is located 177 km southwest of Merida, Yucatan. Although there is a variety of species to fish in Campeche, tarpon are the silver kings when it comes to fly-fishing excitement with light tackle due t their acrobatic fight. 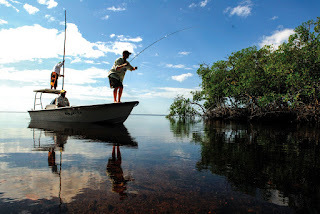 Within Campeche’s coast on the Gulf of mexico lies the Biosphere Reserve of Los Petenes, also known as “Tarpon Coast”, where there are more than 80 miles of mangrove shoreline, countless rivers, cuts, creeks, channels and inner lagoons which make the ideal natural refuge of shelter for the tarpon. According to professional guide Raúl Castañeda of Reef Adventures Campeche, “Los Petenes” is very different from their popular counterparts in the Yucatan Peninsula, including the Ascension Bay in the Riviera Maya. Campeche area is the most important natural nursery for tarpon in Latin America! Fishing is booming here in the coastal areas of Campeche. More and more guide companies are now offering tours that include boat and fishing equipment, so you can learn without having to worry about your equipment. Your only duty is to fish, have fun and enjoy! Besides all the fishing, bird watching is another wonderful experience on the coast where you will easily identify various birds such as pelicans, seagull, white and roseate spoonbill ibis, white and gray herons and hundreds of other unique species. Schedule to see your beachfront lot now and Join the Fun!! Enjoy this presentation of the beautiful area of Sabancuy, a municipality of Ciudad del Carmen (not Playa del Carmen in Quintana Roo). Ciudad del Carmen (Cd del Carmen) is located in the state of Campeche which inside of the Yucatan Peninsula. The Yucatan Peninsulta includes three states. The Yucatan Peninsula's shape is a letter "Y". So, at the left of this letter "Y" we have Campeche, at the top we have Quintana Roo (where Playa del Carmen, Cancún, Tulum and other famous places are located). Campeche is becomming the next Riviera Maya by mandate of the Mexican Goverment. Thus, this explains the construction of huge developments like Aakbal (Marina, Golf and Resort), located just about 7 minute drive from the large, clean and pristine beach lots we are offering for sale. Here I am sharing a video with picures from the area, wildlife, tourist activities and much more! Don't forget to contact us for more information about how to get your slice of paradise here in Sabancuy!! If after watching this video you are not convinced that it is a possibility for you to own a house at the beach, give us a call and we will arrange a viewing trip, no cost.